Peter Lombard, Bishop of Paris, better known as Magister sententiarum, the son of obscure parents, was born about the beginning of the 12th century, at Novara (then reckoned as belonging to Lombardy). After receiving his education at Bologna, he removed to France, bearing a recommendation to St. Bernard of Clairvaux, who first placed him under Lotolf at Reims, and afterwards sent him to Paris with letters to Gilduin, the abbot of St. Victor. He soon became known as a teacher, and obtained a theological chair in the cathedral school. 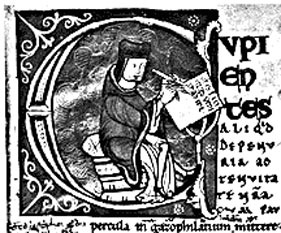 His famous textbook, the Sententiae, was written between 1145 and 1150. On the 29th of June 1159 he became Bishop of Paris. The accounts of his bishopric are satisfactory. There is a charge that he was guilty of simony, having received his office through the favor of Philip, brother of Louis VII, his former pupil. The date of his death is uncertain. According to one account he died on the 20th of July 1160, and as Maurice de Sully became bishop that year the statement seems probable. Yet there is evidence for a later date, and he may have been set aside for simony. His famous theological handbook, Sententiarum libri quatuor, is, as the title implies, primarily a collection of opinions of the fathers, "sententiae patrum." These are arranged, professedly on the basis of the aphorism of Augustine, Lombard's favorite authority, that "omnis doccrina vel rerum est vel signorum", into four books, of which the first treats of God, the second of the creature, the third of the incarnation, the work of redemption, and the virtues, and the fourth of the seven sacraments and eschatology. The Sententiae show the influence of Peter Abelard, both in method and arrangement, but lack entirely the daring of Sic et Non. Compared with that book they are tame. Gratian's Concordia discordantium canonum, as he called his Decretum, was another strong influence Lombard doing in a sense for theology what Gratian did for the canon law. The influence of Hugh of St. Victor is also marked. The relation to the "sentences" of a Gandulph of Bologna (still unpublished) has not been established. The most important thing in the book was its crystallization of the doctrine concerning the sacramental system by the definite assertion of the doctrine of the seven sacraments and the acceptance of a definition of sacrament, not merely as "a sign of a sacred thing", but as itself "capable of conveying the grace of which it is the sign." The sentences soon attained immense popularity, ultimately becoming the textbook in almost every theological school, and giving rise to endless commentaries, over 180 of these being written in England. In 1300 the theological professors of Paris agreed in the rejection of sixteen propositions taken from Lombard, but their decision was far from obtaining universal currency. Besides the Sententiae, Lombard wrote numerous commentaries -- on the Psalms, Canticles, Job, the Gospel Harmony, and the Dauline Epistles -- sermons and letters, which still exist in manuscript. The Glossae seu commentarius in psalmos Davidis, were first published at Paris in 1533.